The end of spring migration. Cape May warblers above, a female and male. A female Cape May on the fountain. 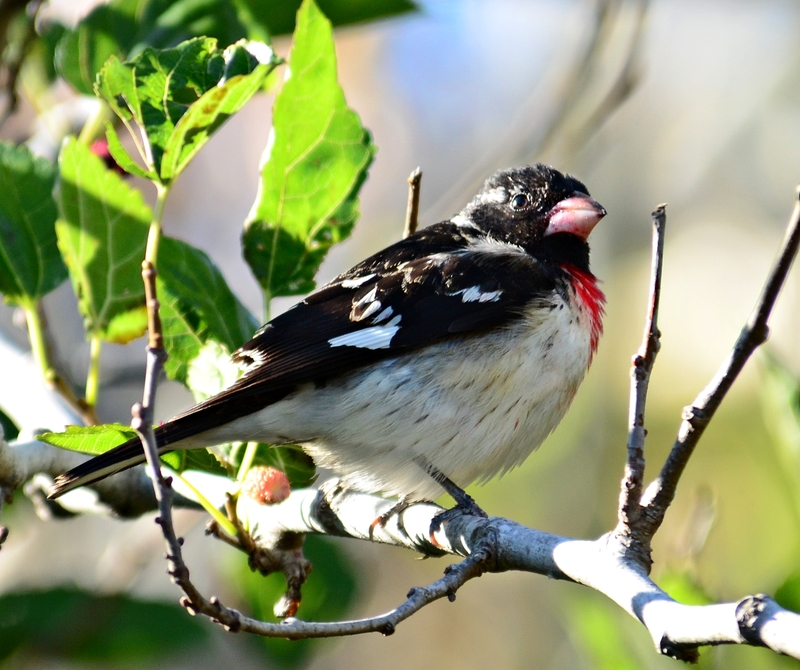 An immature male rose breasted grosbeak with mulberry juice on his face. An ovenbird on the fountain. A blackpoll warbler hanging around. 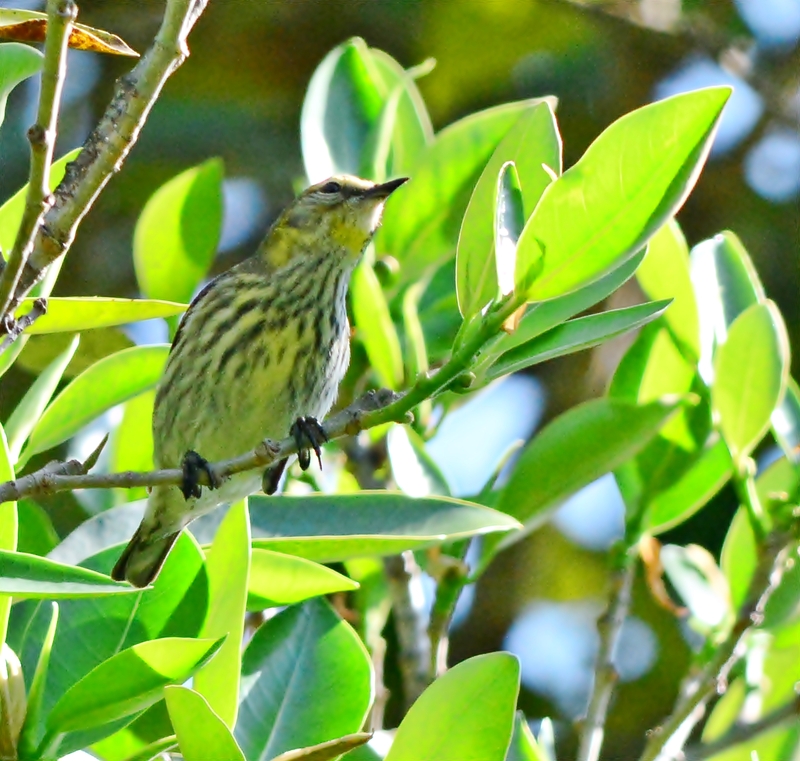 There were still a few interesting birds moving through Fort Desoto in early May, heading north for the summer. It feels like that was so long ago. I’m just finishing editing those pictures and soon the birds will be cruising through again, this time heading south for the winter. So many birds, so little time. 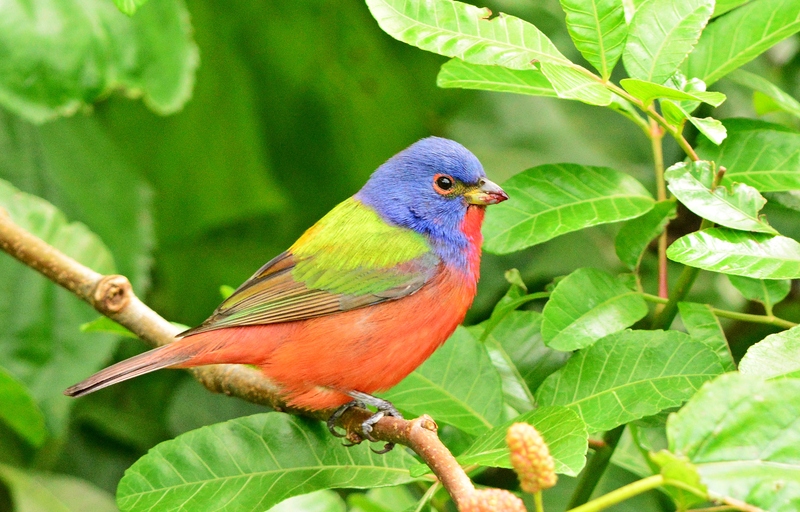 Painted buntings were all over the ground. 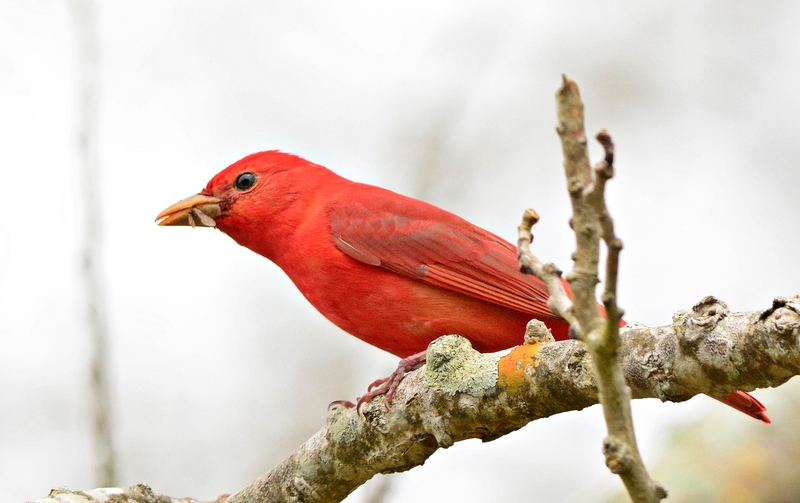 Scarlet tanagers have black wings. 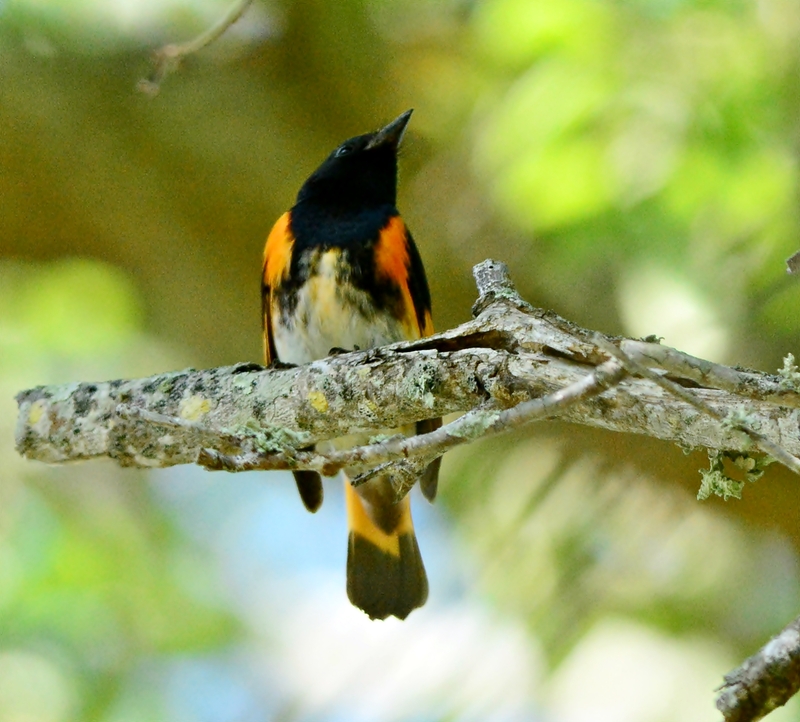 An immature male orchard oriole. He’ll turn a burnt dark orange after his next molt. Above are female orchard orioles. An immature blue indigo looking back at me. 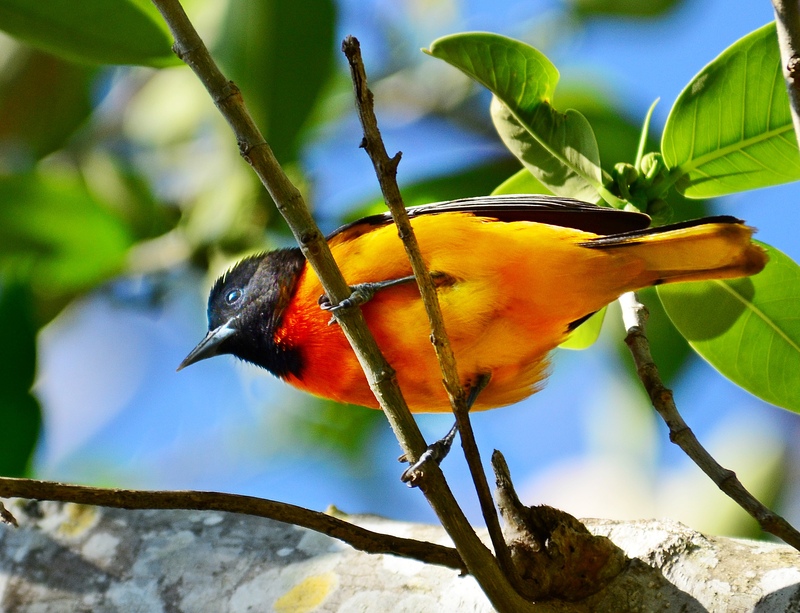 Fort Desoto Park in south Pinellas county is known as a hot spot for birds migrating through in the spring and fall. The birds seem to be more plentiful in spring vs. fall migration. All of the above were seen in a 2 hour period in mid-April. Just standing quietly in the bushes watching them fly in and eat the mulberries with 20 or so other people. All with our long lenses and binoculars. I was using my 300mm lens with a 1.4 extender to zoom in. These are also cropped up so we were all pretty far away. 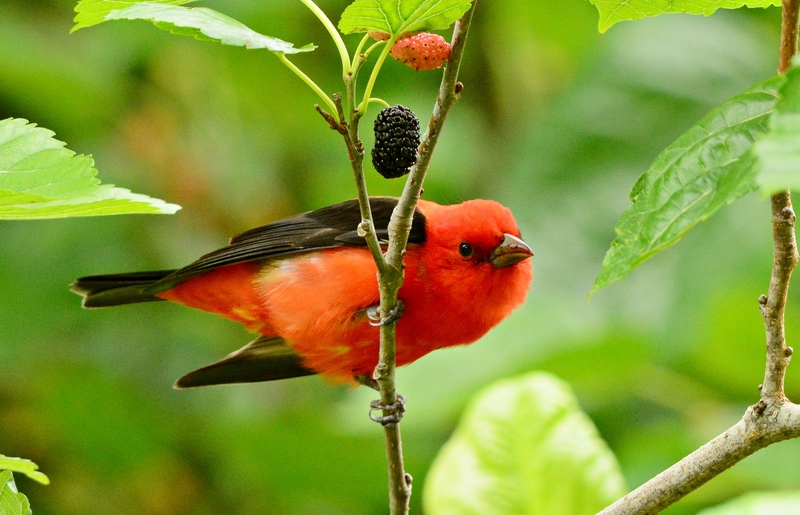 A scarlet tanager high up in a tree with a snack and a pair of doves that were flirting. A squirrel eating a branch. Stopped by Sawgrass Lake park after work in late May for a quick walk before heading home. 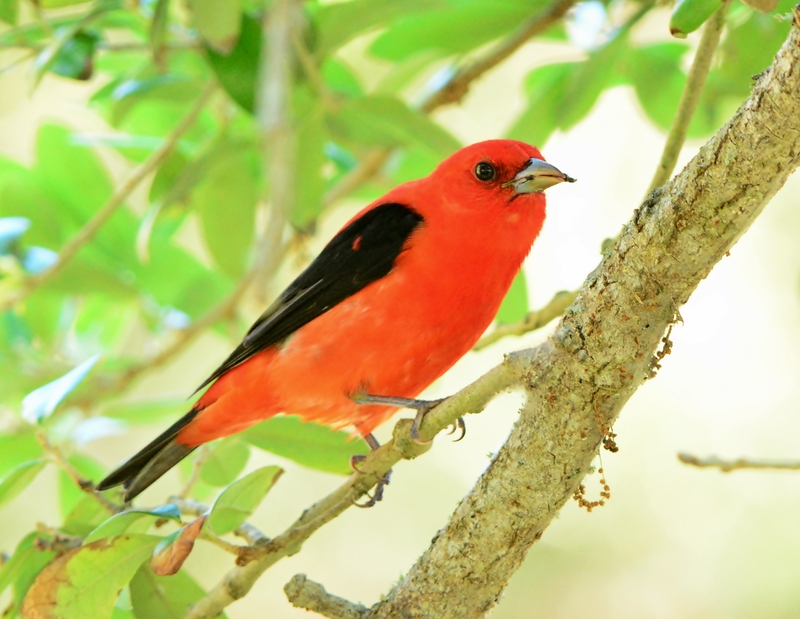 I didn’t expect to find too much but the scarlet tanager was nice. 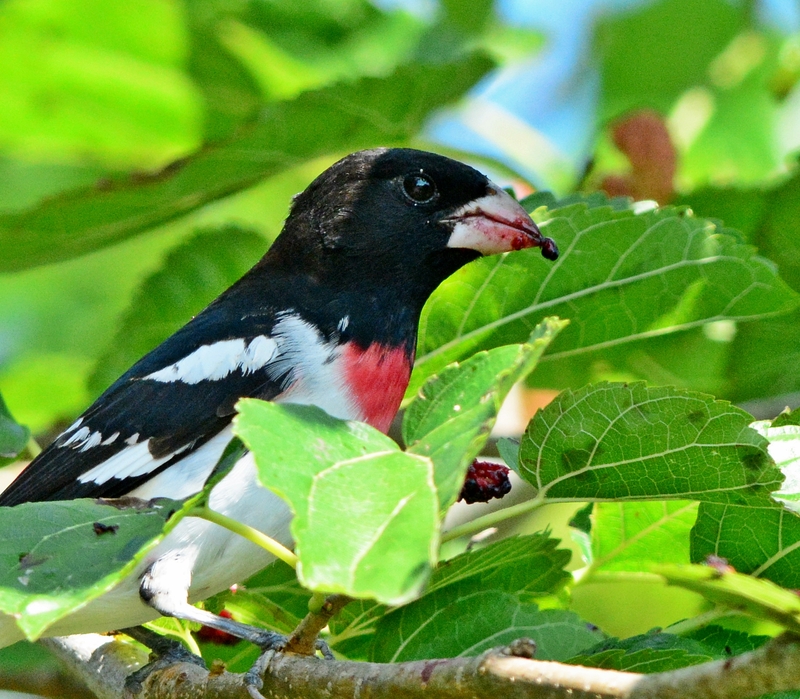 A rose breasted grosbeak chowing on mulberries. Bay breasted warbler. This one is fairly rare around here, even during migration. I can’t remember what this is. Probably just a yellow rumped warbler. I can’t remember what this is either. 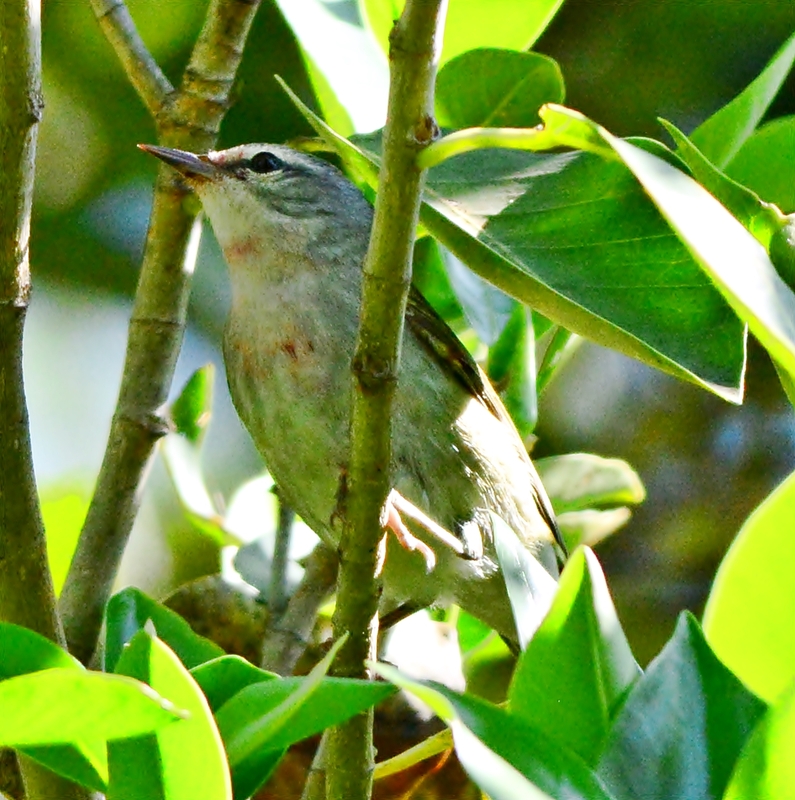 I think a red eyed vireo. 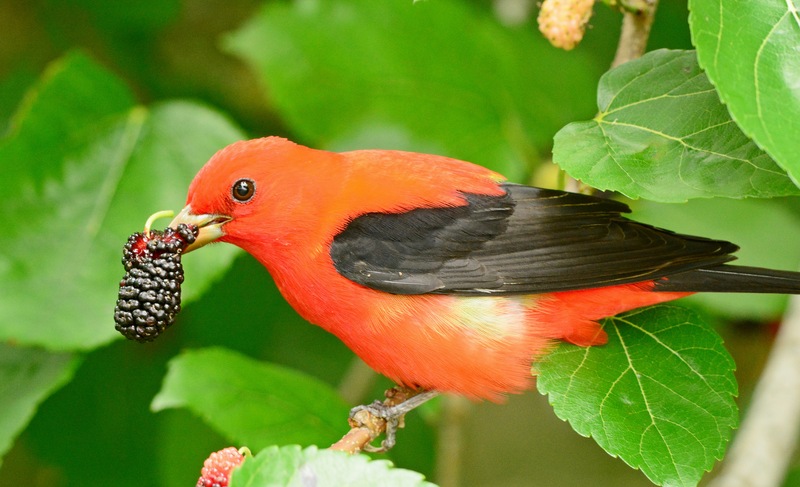 Scarlet tanager with a snack in his beak. 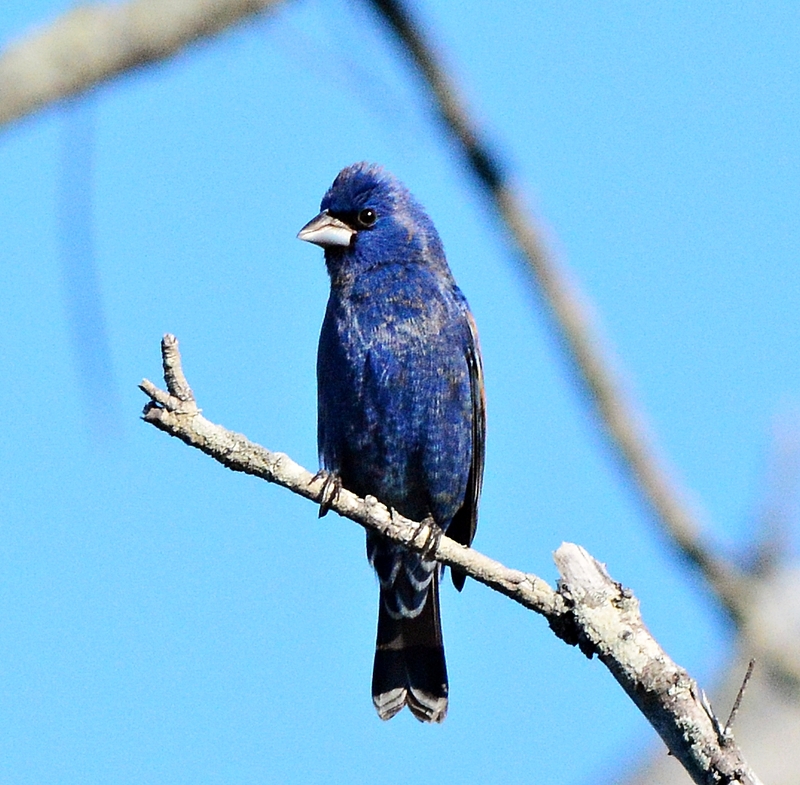 I think this is a blue grosbeak. He had some brown on his feathers. 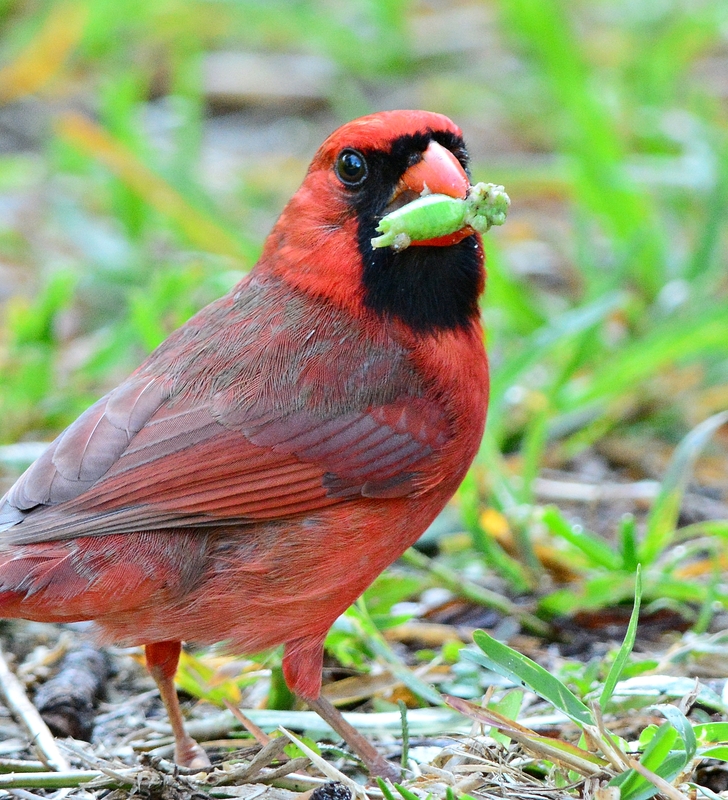 Cardinal with a half eaten grasshopper. 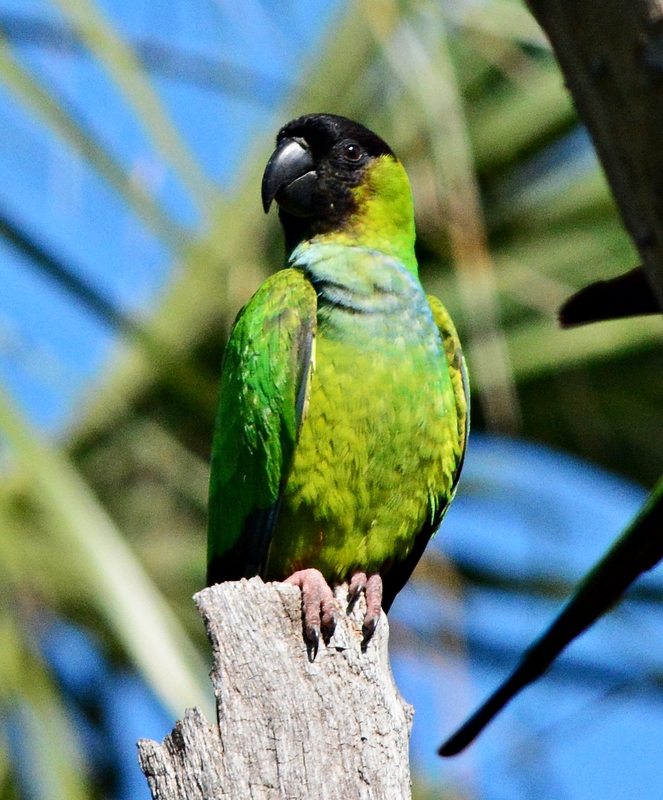 A nanday (black hooded) parakeet showed up in the middle of the little migrating birds. He was looking around like “What are all of these people doing in the woods?” He didn’t stay long. It was early May and spring migration was still going on. The little birds were passing through on their way up north for the summer. Another Saturday morning with the trails packed with people. 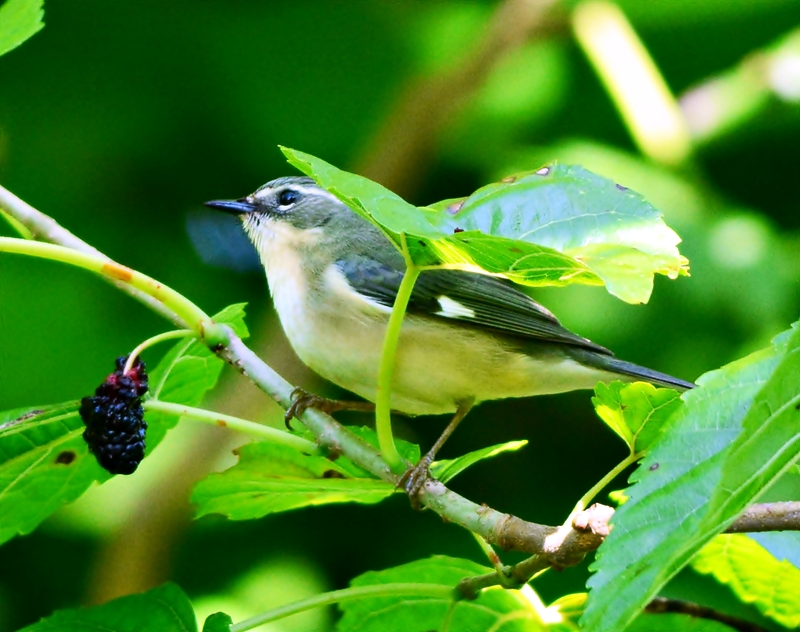 I saw my first Tennessee warbler this morning. I know I should have been more excited but really, they are all starting to look alike. Now that it’s June, not a soul is on the trails except mosquitos but the beaches are packed with tourists. A scarlet tanager looking at me. Maybe he thinks I’m after his berry. 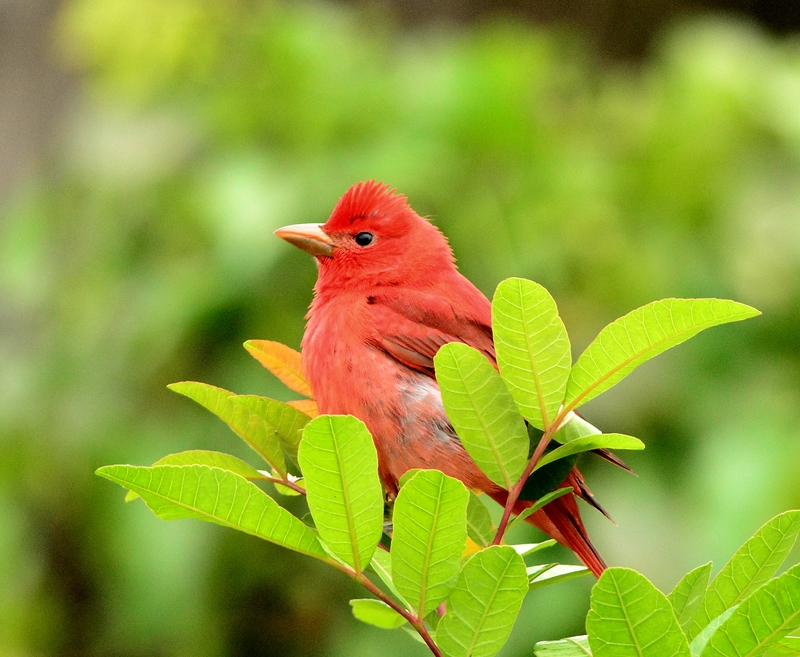 A summer tanager with a bug hanging out of his beak. 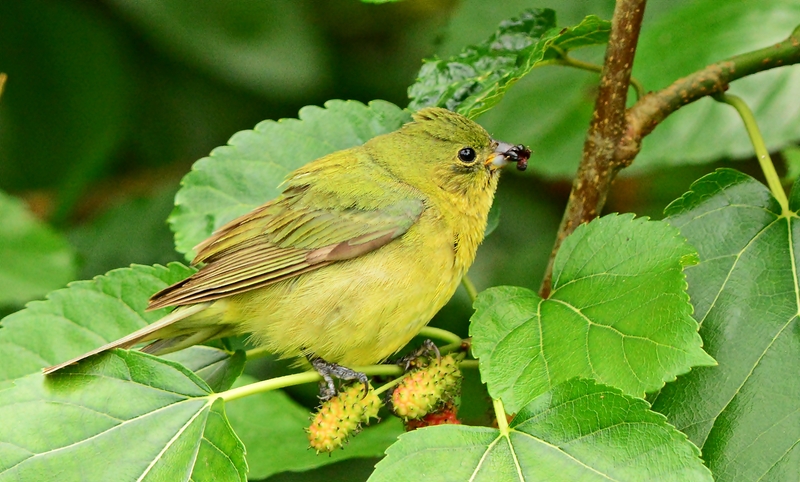 Another scarlet tanager with a beak full. 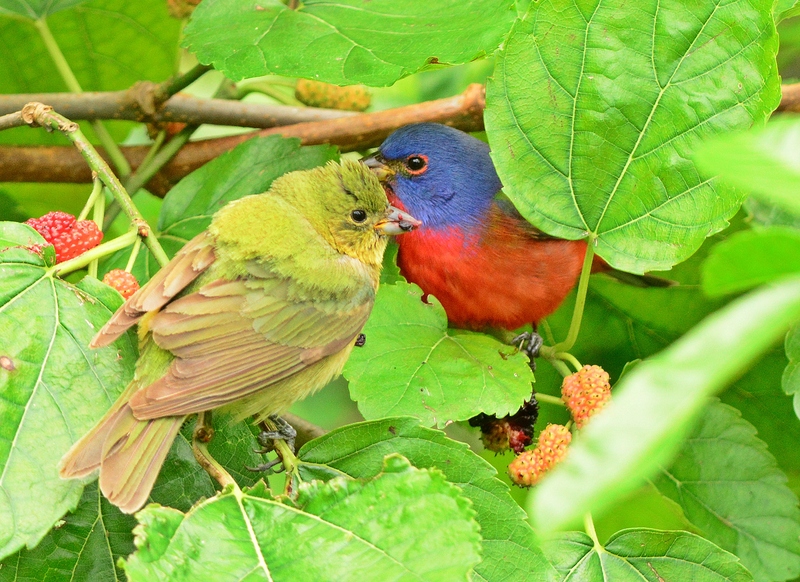 A female and male painted bunting. He has mulberry juice on his beak. She’s got mulberry pieces hanging out of her mouth. These birds were chowing down. 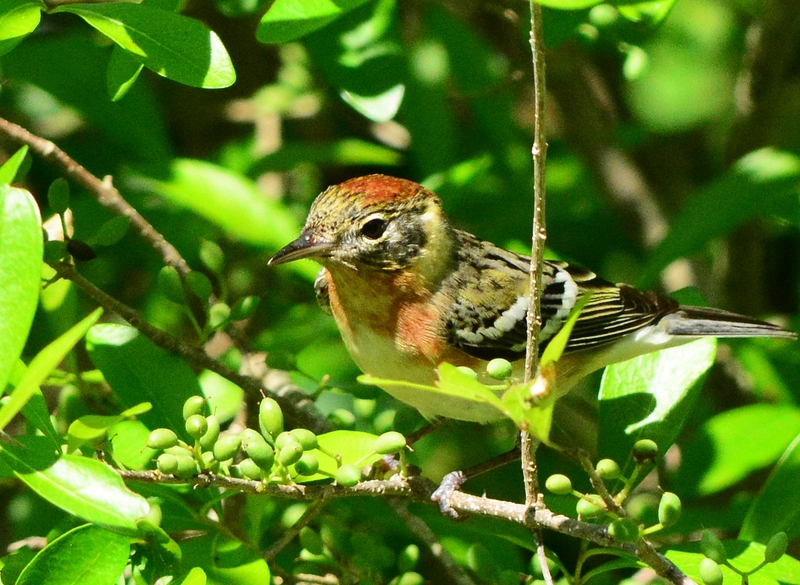 So many pretty birds at Fort Desoto during spring migration. 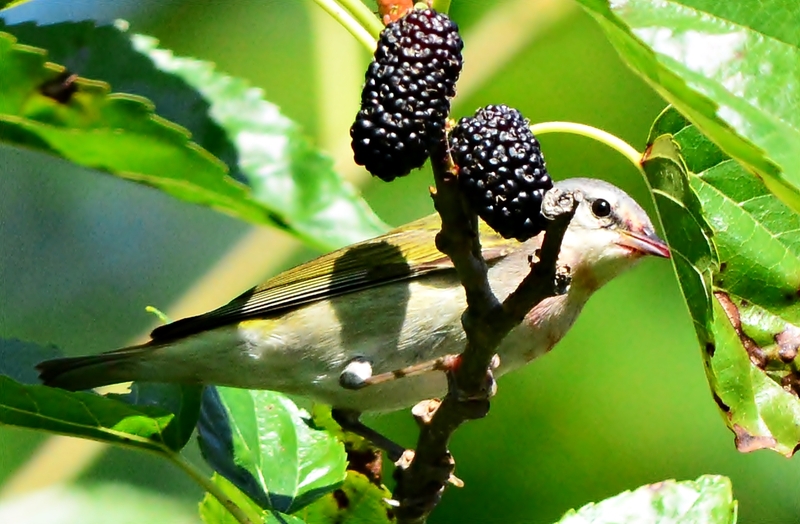 The mulberry trees were full and the birds were hungry. We all just stood in a line and quietly watched them eat. 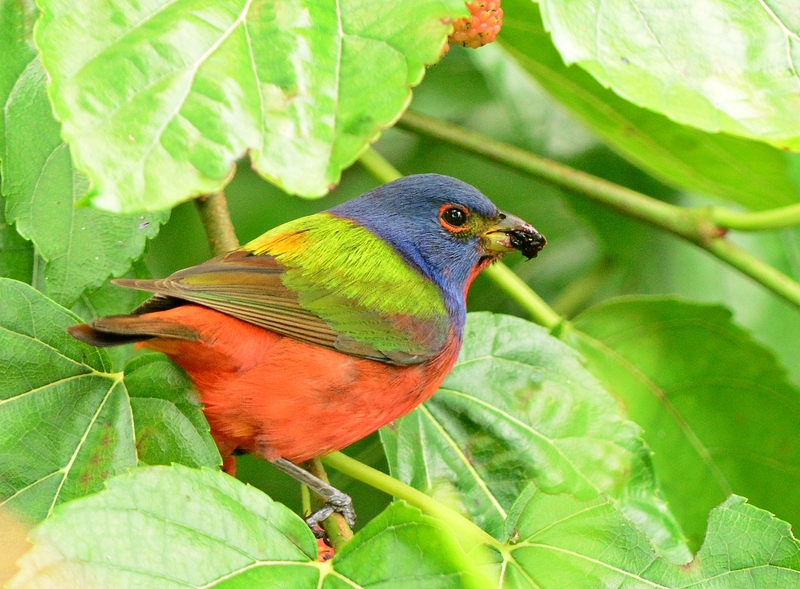 The big prize of the day was the painted buntings.There were several at the park that morning. This is the first decent picture I’ve gotten of one. I also took a ton of blue birds More on those later. 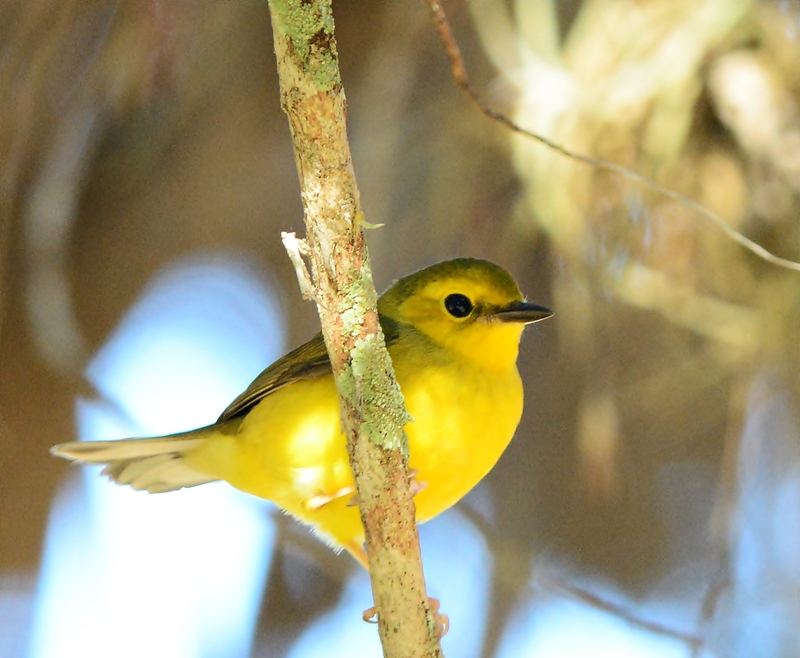 Like a kid in a candy store – spring migration. My first rose breasted grosbeak. 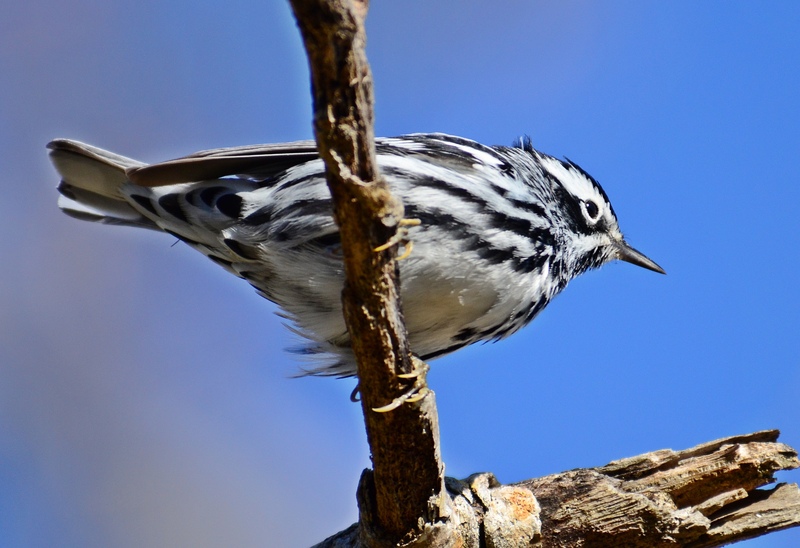 Not my first black and white warbler. I have seen a couple in that past but there were quite a few flying around at Fort Desoto. 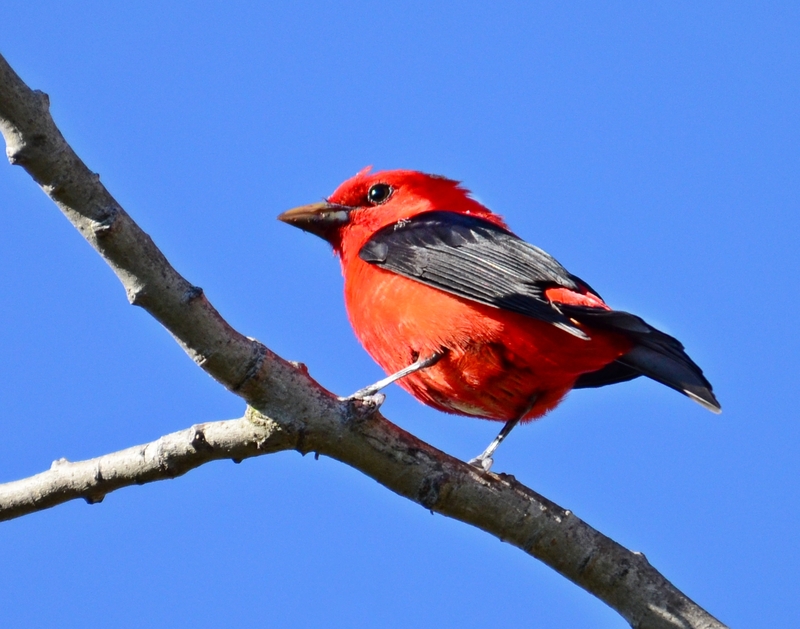 My first scarlet tanager. There was a few there but they stayed high up in the trees. 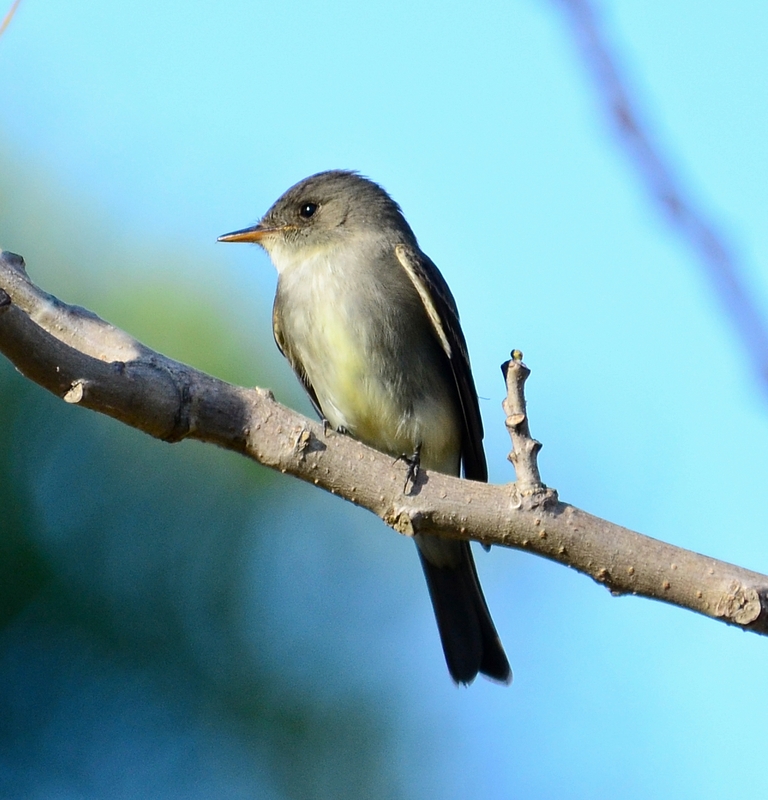 My first eastern wood-pewee. At first I thought this was a phoebe but the bill is a little lighter. I thought I had missed the boat. Saturday, 4/21, a nasty storm moves through the Tampa bay area. I did chores and ran errands. Sunday morning I woke up to sunny skies so I headed out to a park. I thought that since there were extremely high winds at Fort Desoto, it might not be a good place to go since water birds tend to be scarce on windy days. I decided to go inland to Circle B Bar Reserve in Lakeland. It was a nice morning and I saw some cool things. Later that night I was reading Pinellasbirds.com and just found out how little I knew about birding. The sky was falling with birds at Fort Desoto. Record numbers of migrating birds had landed there. I knew I had a long work week ahead so my heart fell. But all was not lost. I was able to leave work at a reasonable time on Tuesday night and headed straight for Fort Desoto. I headed first to the east beach turnaround and then to the mulberry bush woods at the ranger’s house. There were birds flying everywhere. All colors flashing by. I was so excited I didn’t know where to start. I just stood there and started snapping away. My friend Pam and her hubby met me there because they wanted to see what all the excitement was about. We stayed until the sun went completely down and it was dark driving out. More to come tomorrow.